The course is based on the theory of multiple intelligences and offers a fun and multisensory approach through songs, chants, motory sensory, colouring, logistic and craft activities. The main character is Hélico, a fantastic koala who travels in a magic helicopter. Surrounded by fun activities and games, children learn together with Hélico basic French vocabulary and linguistic...more.. The course is based on the theory of multiple intelligences and offers a fun and multisensory approach through songs, chants, motory sensory, colouring, logistic and craft activities. The main character is Hélico, a fantastic koala who travels in a magic helicopter. 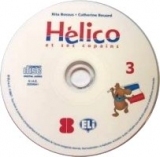 Surrounded by fun activities and games, children learn together with Hélico basic French vocabulary...more..
Hélico arrives in France, in Poitiers and becomes friends with Léo, a lively 8 year old boy. The five friends, together with the friendly koala will become the main characters of great adventures, but also of the ups and downs of their daily lives. The didactic journey is gradual but rich and complete, and continuously revises and consolidates previous topics. It is supplemented by...more..
Children follow the group of friends - Léo, Hèlico, Annie, Thibaut, Mengying and Habib which allows the teacher to deal with the topic of accepting differences, tolerance, multiculturalism. Mengying and Habib come from different ethic backgrounds but are totally and perfectly accepted by their French pals. In fact, children begin to look at culture and French civilisation in this volume and...more.. In this volume there are more references to aspects of civilisation, previously presented in the other volumes. The volume begins with topics of interest for young children (favourite foods, school timetable, favourite magazines and books, television channel) and also includes references to famous people, related to historic and geographic news (not monuments and places representing...more.. The first of a series of 3 activity books to keep in touch with the French language during the summer holidays and to consolidate all that the children have learnt with Hélico during the school year. Each volume offers manual activities, games to complete alone or with companions, listening exercises and songs which continue the fun and communicative approach used during the year. more.. The second of a series of 3 activity books to keep in touch with the French language during the summer holidays and to consolidate all that the children have learnt with Hélico during the school year. Each volume offers manual activities, games to complete alone or with companions, listening exercises and songs which continue the fun and communicative approach used during the year.more.. 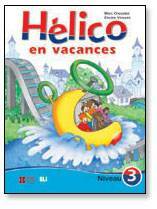 The third of a series of 3 activity books to keep in touch with the French language during the summer holidays and to consolidate all that the children have learnt with Hélico during the school year. Each volume offers manual activities, games to complete alone or with companions, listening exercises and songs which continue the fun and communicative approach used during the year. In...more..